Simon has a Pro Tools HD3 equipped home studio. Using Pro Tools, Logic and Melodyne software the studio is his mix and production facility. His Intel Mac Pro rig is loaded with many plug-ins and software instruments that are in addition to those supplied as standard with Pro Tools and Logic. Additional plugs-ins include: Waves, Soundtoys, URS, Crane Song, Antares, SPL, McDSP, Altiverb, Massenberg, Abbey Road, Massey and Synchro Arts. 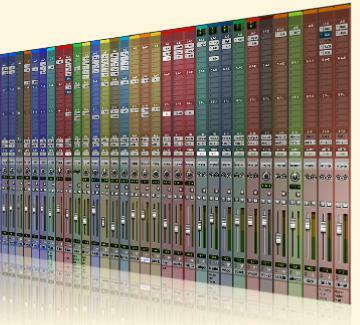 Additional software instruments include: Spectrasonics, East West, Native Instruments, Toontrack, G-Force and Synthogy. Hardware includes: Avid 192, Summit, Neve, Focusrite, Smart, M Audio, Roland and Rosendahl. Monitoring: KRK VXT8 and V4, Yamaha NS10m, Auratone. Quad 520f amplifiers. Mix projects at his studio include: Cerys Matthews, Primal Rock Rebellion, The Queen Symphony, Asia, Tyler Rix, The Wild Lies, Kino, Docker’s Guild, The Genesis Suite and SHY.